Your day-by-day itinerary now includes Hydraiki Athens One Day Cruise, Mount Lycabettus, Parthenon, and other attractions you added. Get a sense of the local culture at Plaka and Acropolis Museum. Acropolis of Athens and Erechtheion will appeal to history buffs. The adventure continues: delve into the distant past at Temple of Olympian Zeus. To see photos, where to stay, ratings, and tourist information, read our Athens trip maker . Auckland, New Zealand to Athens is an approximately 30-hour flight. You can also do a combination of flight and train. The time zone difference when traveling from Auckland to Athens is minus 10 hours. When traveling from Auckland in September, plan for warmer days and somewhat warmer nights in Athens: temperatures range from 34°C by day to 24°C at night. Finish your sightseeing early on the 16th (Mon) to allow enough time to travel to Dubrovnik. Your day-by-day itinerary now includes Sveti Jakov Beach as well as Luza Square. Satisfy your inner culture vulture at Old Town and Rector's Palace. Walls of Dubrovnik and Fort Lovrijenac will appeal to history buffs. Next up on the itinerary: get engrossed in the history at Franciscan Monastery and enjoy breathtaking views from Upper Corner Tower Foundry Museum. For more things to do and tourist information, refer to the Dubrovnik tour itinerary planning app . Getting from Athens to Dubrovnik by flight takes about 5.5 hours. Other options: do a combination of flight and bus; or drive. Due to the time zone difference, you'll gain 1 hour traveling from Athens to Dubrovnik. Prepare for a bit cooler weather when traveling from Athens in September: high temperatures in Dubrovnik hover around 29°C and lows are around 20°C. Wrap up your sightseeing by early afternoon on the 18th (Wed) to allow time for travel to Venice. Your day-by-day itinerary now includes Chiesa di San Salvador as well as Murano, Burano & Torcello Half-Day Sightseeing Tour. Basilica di San Marco and St Mark's Campanile will appeal to history buffs. Attractions like Doge's Palace and Ponte di Rialto make great kid-friendly stops. There's still lots to do: make a trip to St. Mark's Square, explore the activities along Canal Grande, snap pictures at Ponte dei Sospiri, and contemplate in the serene atmosphere at Santa Maria dei Miracoli. For photos, reviews, and other tourist information, read Venice trip builder tool . Traveling by flight from Dubrovnik to Venice takes 5 hours. Alternatively, you can drive; or do a combination of ferry and bus. In September, daytime highs in Venice are 29°C, while nighttime lows are 17°C. Wrap up your sightseeing by early afternoon on the 22nd (Sun) to allow enough time to travel to Amalfi. Your list of things to see and do now includes Castello Doria, Santa Margherita di Antiochia Church, Castello di Riomaggiore, and other attractions. 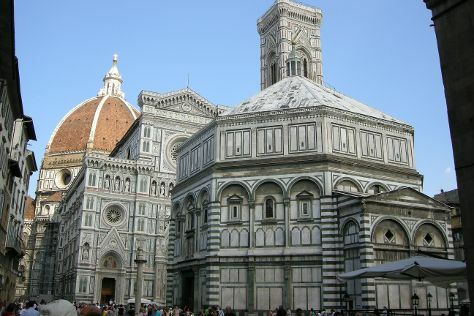 On the 22nd (Sun), take in the views from Ponte Vecchio, take in panoramic vistas at Campanile di Giotto, contemplate in the serene atmosphere at Cathedral of Santa Maria del Fiore, get to know the fascinating history of Piazza del Duomo, then get engrossed in the history at Basilica di Santa Croce, and finally don't miss a visit to Piazzale Michelangelo. Keep things going the next day: step into the grandiose world of Castello di Riomaggiore, take a stroll around Vernazza, then take in the architecture and atmosphere at Santa Margherita di Antiochia Church, and finally step into the grandiose world of Castello Doria. For where to stay, other places to visit, ratings, and more tourist information, read Florence road trip site . You can take a train from Venice to Florence in 2.5 hours. Other options are to drive; or take a bus. In September, plan for daily highs up to 30°C, and evening lows to 17°C. You'll have a few hours on the 24th (Tue) to wrap things up before traveling to Rome. On the 25th (Wed), explore the different monuments and memorials at Camposanto, then enjoy breathtaking views from Leaning Tower of Pisa, then contemplate in the serene atmosphere at Battistero, and finally take in the spiritual surroundings of Duomo di Pisa. To see other places to visit, ratings, photos, and more tourist information, use the Pisa driving holiday planner. Take a train from Florence to Pisa in an hour. Alternatively, you can drive; or take a bus. In September, daily temperatures in Pisa can reach 30°C, while at night they dip to 17°C. Finish your sightseeing early on the 25th (Wed) so you can travel to Rome. Your day-by-day itinerary now includes Circus Maximus, Piazza del Campidoglio and Piazza di Spagna. Visit Palatine Hill and Piazza Navona for their historical value. Bring the kids along to Colosseum and Trevi Fountain. There's much more to do: explore the world behind art at Vatican Museums, don't miss a visit to Pantheon, steep yourself in history at Roman Forum, and pause for some serene contemplation at Santa Maria in Trastevere. To see where to stay, traveler tips, other places to visit, and more tourist information, use the Rome journey maker . Getting from Florence to Rome by train takes about 2 hours. Other options: drive; or fly. In September, daytime highs in Rome are 32°C, while nighttime lows are 18°C. Wrap up your sightseeing on the 28th (Sat) to allow time to travel to Amalfi. Known for its impressive hillside cascade of colorful stone buildings down to the Mediterranean shore, Amalfi is the cultural and commercial heart of southern Italy's Amalfi Coast. Your day-by-day itinerary now includes Amalfi Coast to Capri Boat Excursion. Family-friendly places like Sentiero degli dei (Path of the Gods) and Lido di Ravello will thrill your kids. There's more to do: contemplate in the serene atmosphere at Duomo di Sant'Andrea. To find more things to do, ratings, maps, and tourist information, read our Amalfi visit planning tool . Traveling by train from Venice to Amalfi takes 7 hours. Alternatively, you can do a combination of flight, train, and bus; or drive. Expect a bit warmer evenings in Amalfi when traveling from Venice in September, with lows around 24°C. On the 26th (Thu), you'll travel to Pompeii. Kick off your visit on the 3rd (Thu): take in the spiritual surroundings of Pontificio Santuario della Beata Maria Vergine del Santo Rosario di Pompei and then delve into the distant past at Pompeii Archaeological Park. To see where to stay, more things to do, and other tourist information, you can read our Pompeii road trip website . Traveling by car from Amalfi to Pompeii takes an hour. Alternatively, you can take a bus; or do a combination of bus and train. Plan for slightly colder nights when traveling from Amalfi in October since evenings lows in Pompeii dip to 17°C. Wrap up your sightseeing by early afternoon on the 3rd (Thu) to allow enough time to travel to Nice. Start off your visit on the 4th (Fri): take a stroll through Vieille Ville, then take in the architecture and atmosphere at St Nicholas Cathedral, and then see the interesting displays at Musée Marc Chagall. Inspirock's itinerary builder makes planning a Nice trip simple and quick. You can fly from Pompeii to Nice in 5 hours. Alternatively, you can do a combination of train and flight; or drive. Expect a daytime high around 24°C in October, and nighttime lows around 17°C. Finish your sightseeing early on the 4th (Fri) to allow enough time to drive to Genoa. Once the most important harbor in the Mediterranean Sea, Genoa has a long history as a rich and powerful trade center in northern Italy. Plan trip to Genoa with our itinerary maker to find out where to go and what to do. Traveling by car from Nice to Genoa takes 2.5 hours. Alternatively, you can take a bus; or take a train. In October in Genoa, expect temperatures between 24°C during the day and 17°C at night. 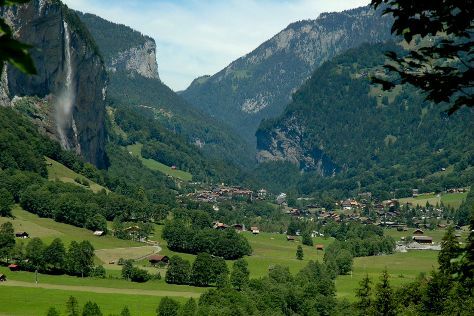 On the 5th (Sat), you'll travel to Lauterbrunnen. A small village in a valley, Lauterbrunnen showcases an abundance of awe-inspiring waterfalls. 007 Walk of fame - Schilthorn has been added to your itinerary. Get in touch with nature at Jungfraujoch and Lauterbrunnen Valley Waterfalls. There's still lots to do: admire the sheer force of Trümmelbachfälle and take in the awesome beauty at Wengen Mannlichen Aerial Cableway. For traveler tips, where to stay, and more tourist information, read Lauterbrunnen sightseeing app . Traveling by car from Genoa to Lauterbrunnen takes 5.5 hours. You will leave for Zurich on the 9th (Wed). For reviews, photos, ratings, and tourist information, refer to the Zurich trip planning website . You can drive from Lauterbrunnen to Zurich in 2 hours. Other options are to take a train; or take a bus. In October, daytime highs in Zurich are 17°C, while nighttime lows are 8°C. You'll set off for home on the 9th (Wed).